We are fortunate to have dynamic staff in all departments at 21 Acres. 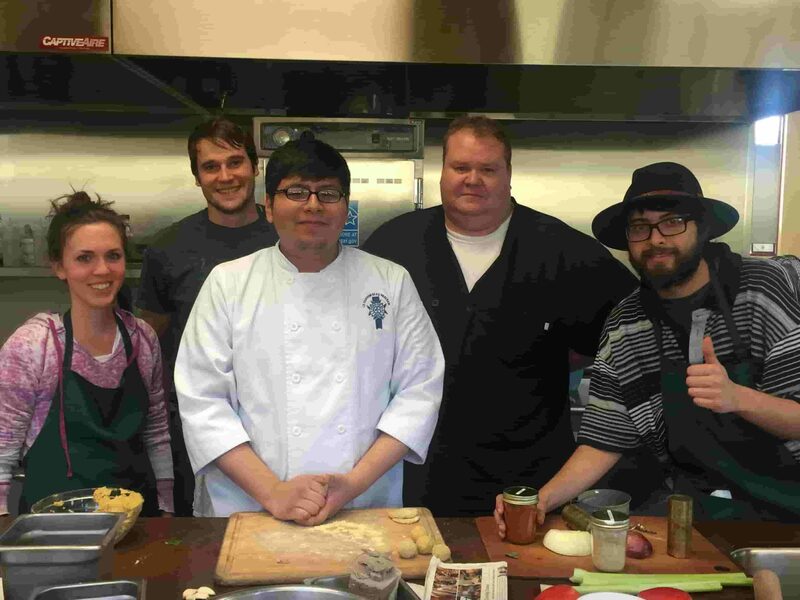 Just one of these invaluable team members is Jacob Sandoval who works in our kitchen. Jacob recently took the time to share a blog post with us that he wrote. We enjoyed reading it and thought our followers might as well. Find it here. Here’s a recent photo of our kitchen team gathering together quickly after a busy morning making food to-go for the Farm Market. Jacob is all the way on the right with the fedora. Jacob came to be a valued member of the 21 Acres team at the suggestion of Patricia Newkirk – of Songaia Co-housing in Bothell; Jacob was living and working as an intern for Songaia (while going to school). Patricia is involved with 21 Acres as a member/volunteer and through the group, Permaculture Woodinville, which meets at 21 acres once a month. Having seen our advertisement for event staff, Patricia suggested that Jacob apply. In his trademark black felt hat, Jacob worked a couple of events and then as fate would have it, one day we needed a dishwasher and Jacob stepped into the role easily and continues helping us regularly. Jacob also helps the kitchen team to do prep work when needed. He takes his role and experience very seriously – whether he is washing dishes, helping serve at an event, or chopping kale, or mopping the floor, he does it with diligence and flawless execution; his passion for food and the sustainable lifestyle it connects and resonates with, is evident. All that and he plays the accordion as well!